I’m lucky to be working with some remarkable people who push the boundaries of prospecting. LinkedIn’s new InMail Policy allows you to send only 15 messages for free per month. For those who know how to send InMails for free via Groups, this was a HUGE setback. But not for my colleague Matt. Matt is our sales development rep and has a reputation for setting a consistent number of demos, no matter what. So when this new LinkedIn InMail policy came up, instead of spending a bundle on InMail, he just changed tactics. The result: his numbers didn’t even take a dent. Matt knows the pulse of our ideal customer. He’s figured out how to find that prospect on Linkedin. He changed his LinkedIn headline to something that would be of interest to prospects. 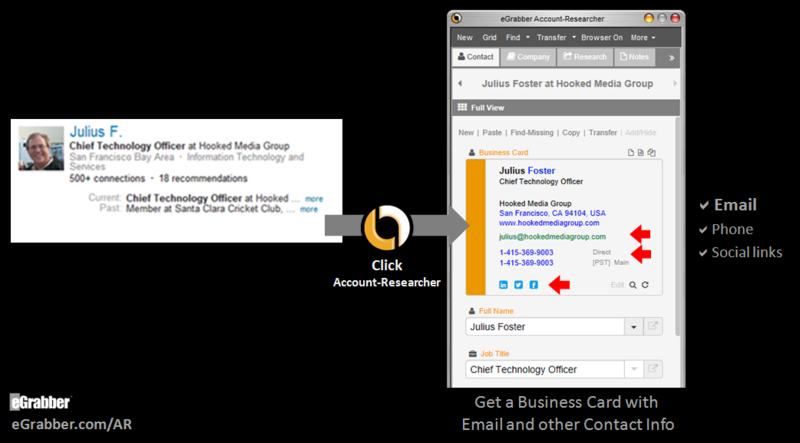 For those prospects who did not react to Matt’s profile visit, he got their email address using eMail Prospector and sent an outbound email to their business email address. He used this most effectively on LinkedIn Group members. He could now contact just about anyone in his network. Here’s a video demo of eMail-Prospector, for you to see it live. Feeding your sales engine with a steady flow of qualified B2B sales leads is one of the vital ingredients of success. But how? Let us first look at some of the effective B2B lead generation methods that are widely used by B2B marketers – Inside sales, Telemarketing, Email marketing, Tradeshows, Conferences, Webinars, Websites, Search marketing, Social media. Do you really need to employ all of the above methods for your business or is there a B2B lead generation formula that works like magic? The answer is a big NO. The fact is there is no “one size fits all” solution. You got to experiment and figure out what works best for your business. Once you set the things right doesn’t mean that you can go on with it for life. What works for you today might not work after a year. So you got to continuously experiment on various things to stay afloat and move forward which eventually takes a lot of your time and resources. This is where a B2B lead generation software such as LeadGrabber can be handy. LeadGrabber helps you to generate qualified B2B sales leads from the Internet in no time. It helps you to build fresh B2B sales leads lists along with contact information such as name, job title, company, business email address, phone number, address, website, etc. based on the industry, domain, location, etc. 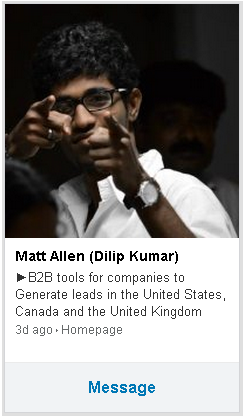 LeadGrabber helps you to feed your sales engine with qualified B2B sales leads. It also helps you to append verified business email addresses and phone numbers of your contacts and find top decision makers in a company. LinkedIn® Groups are one of the best sources to generate highly targeted sales leads. However, it is not as easy as it is said. There are certain limitations – you can join a maximum of only 50 groups, many groups don’t allow everyone to join, etc. These limitations prevent you from accessing the group members who could be your potential customers. One way to overcome this problem is to search LinkedIn® group members through Google. Yes, because almost all LinkedIn® profiles are indexed by Google. Therefore a Google search for LinkedIn® profiles from a particular LinkedIn® Group displays the profiles of the group members. This enables you to know the group members without being a member of that group. But if you were to do this manually, you got to write your own Google search scripts, search and manually click each profile to find your prospect contact information which is a tiresome and time-consuming process. Imagine how much time and effort it would take if you want to repeat this process for 100s of contacts. This is where a lead generation software such as LeadGrabber can be handy. The expert Boolean search scripts in LeadGrabber instantly finds the groups members of that particular group from Google. Click Grab to build a list of profiles from the specified LinkedIn® group. What are you waiting for? Use LeadGrabber to generate sales leads from LinkedIn® Groups through Google. If you are not able to consistently generate qualified B2B sales leads for your business, then you are in trouble. Most of the B2B companies say that one of their toughest challenges is to generate a continuous stream of qualified B2B sales leads. What is even worse is, some companies spend a lot of time and resources looking for B2B leads at the wrong places. Search engines, professional networking sites, online business directories are rich sources to generate B2B sales leads. But the challenge is, you got to manually search various websites to find your prospects and their contact information. It takes a lot of time and effort. This is where a B2B lead generation software such as LeadGrabber Pro can offer you the winning edge. LeadGrabber Pro helps you to generate qualified B2B sales leads for your business in no time. LeadGrabber Pro enables you to generate sales leads based on industry, job title, geography, company size, and revenue. 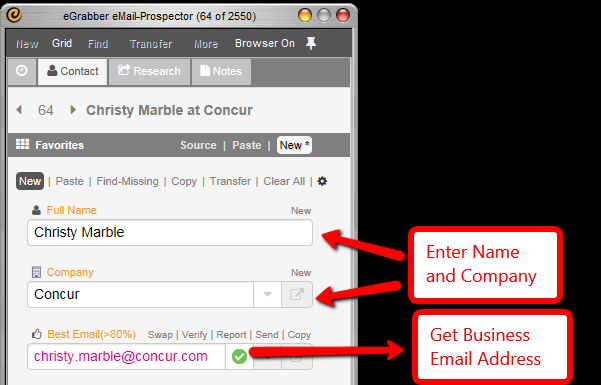 You can instantly transfer your prospect lists to Excel or your CRM. 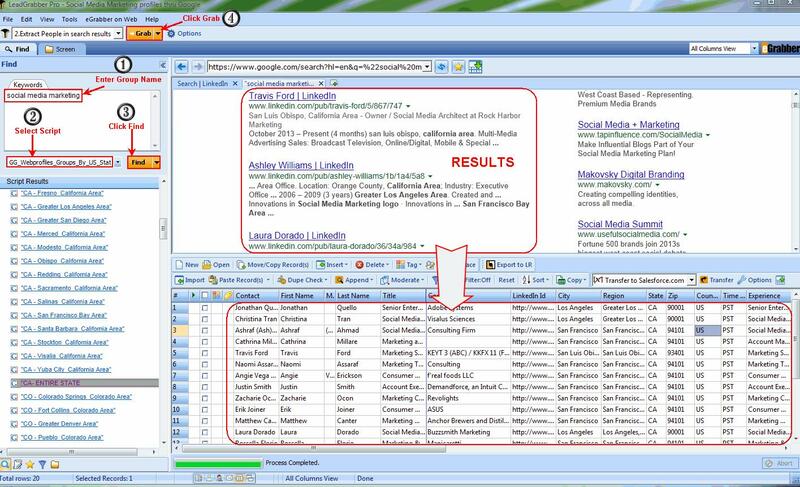 With LeadGrabber Pro, you don’t have to spend countless hours on lead generation anymore. Just run the tool overnight and the next day your sales team can start emailing or calling your prospects right away! It saves a lot of your time and resources and helps you focus on closing more sales and improving your sales ROI. A lot of B2B companies have used LeadGrabber Pro and reaped great benefits – generated qualified sales leads faster, acquired more clients, closed more sales, increased sales revenue and many more! Why would you want to wait? In a webinar I completed with Josh Turner of Linked University yesterday, we discussed the need for finding email address of prospects you found on your favorite social network. black hole? You sent that request a month ago, and still no response? But think of it from the other side: if you are the decision maker who is receiving the connection request from a sales person, WHY would you answer that connection request? You KNOW you are going to be sold! To get in front of decision makers, you require their business email address. You can increase your chances of a conversation with a connection request, but you NEED a business email address. You can get that business email address from Jigsaw at $1 a piece, or you can source the email address from the Internet for free. Yes, FREE! There are techniques of finding email addresses from the Internet, but that’s a topic for a complete whitepaper. BINGO! Email address to use. Works for any contact in any company on the Internet. In a webinar I spoke at yesterday, we showcased three companies whose webinar invitees list was built from Online Profiles and Online Groups using LeadGrabber Pro. The companies got between 20-120 times improvement in their Email-Registrant conversion ratio, over the traditional method of inviting people. The first company is a virtual agent provider. As you can see from the table, with the traditional method they were able to get 4 out of 3500 contacts to register from a purchased list. However, by searching on for user groups that were having discussions related to their webinar, they were able to message to a very targeted list of only 84 harvested contacts. 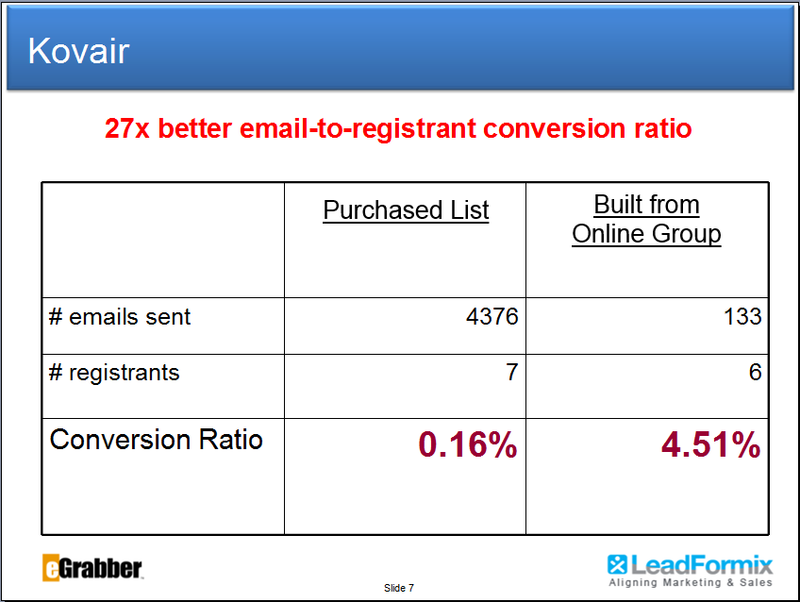 The result is that they were able to get almost 3x more registrants, resulting in a 119 times better email to registrant conversion ratio. The second company provides provides application lifecycle management and IT service management solutions. Here is a comparison of a purchased list with about 4400 contacts compared to sourcing contacts from a targeted discussion group. They almost had the exact same amount of registrants from harvesting 133 contacts. The key take away is that these examples are just samples of sourcing contacts from just one group! The third company provides IT security and compliance management solutions that help reduce the time it takes to complete the certification process. Similar to the previous example, they almost got the exact same number of registrants as they did from a purchased list. Resulting in a 19 times better email to registrant conversion ratio. All new MRI franchisees are trained to build revenue pipeline using eGrabber’s Power Sourcing Suite. eGrabber Inc., the developer of the world’s most powerful B2B list building tools for Recruiting and Staffing firms, has been chosen by MRINetwork as a standard inclusion in its New Office Development training program. MRINetwork is the world’s largest search and recruitment organization with more than 1,100 offices in over 35 countries and system wide billings of nearly $500 million. The New Office Development (NOD) program is a six-week training given to all new MRI owners/managers. Besides training material, MRI offices are provided with a software bundle to help them start and run their business. eGrabber’s Power Sourcing Suite is now part of that software bundle. With the eGrabber Suite, MRI offices can market to more clients and grow candidate pipelines. The software quickly builds lists of hiring companies and their hiring managers, so that users can market to more clients and close candidate placements faster. The Suite builds candidate pipelines by giving an easy way to source candidates in real time on professional networks, social networks, job boards and search engines and import the resumes directly into Applicant Tracking Systems, like PCRecruiter. “Recruiting and Staffing firms who buy eGrabber get ROI within the first 30 days of using it. And eGrabber does not charge per lead, so you can grow your revenues without the cost,” said Hassaan Sophie, Business Development Manager, eGrabber. eGrabber Inc., the developer of the world’s most powerful B2B list building tools for Recruiting and Staffing firms, has been chosen by MRINetwork as a partner in its New Office Development training program. MRINetwork is the world’s largest search and recruitment organization with more than 1,100 offices in over 35 countries and system wide billings of nearly $500 million.The New Office Development (NOD) program is a six-week training given to all new MRI owners/managers. Besides training material, MRI offices are provided with a software bundle to help them start and run their business. eGrabber’s Power Sourcing Suite is now part of that software bundle.